The 11th 2012 China Shenyang international automobile industry exposition, with the theme of “Innovation, harmony, and beyond” was held in the Shenyang international convention & exhibition center on June 28. Vice president Xie Biao and former vice president Wang Songlin from China National Machinery Industry Corporation, vice mayor Qi Ming from Shenyang Municipal Government, vice chairman Han Xiaoyan from the Shenyang Chinese People's Political Consultative Conference, president Ji Xuecheng, vice presidents Jing Yongjian, Zhao Haiming, and Wen Yimei from CNAICO, and vice president Christian Schröter from Mercedes-Benz (China) attended the opening ceremony. Vice president Xie Biao from China National Machinery Industry Corporation pointed out in the opening speech, that the convention & exhibition industry is a creative and sunrise industry highly related to industries and cultures. For a long time, China National Machinery Industry Corporationhas been focusing on the convention & exhibition industry and promoting its continuous development. Exhibitions sponsored by China National Machinery Industry Corporationand its subordinate enterprises have become world-class and internationally well-known, which drives the industry development and plays a positive role in promoting cultural exchange and spread. Vice mayor Qi Ming in his speech affirmed the role of the exposition in terms of stimulating domestic demands and promoting consumption. She emphasized that the Shenyang international automobile industry exposition was one of the large-scale exhibitions of Shenyang and an industry pacemaker regarding the exhibition scale, regional influence, and brand appeal. She hoped that the Shenyang international automobile industry exposition will make a greater contribution in promoting Shenyang automobile industry exchanges and cooperation, guiding the automobile circulation and consumption, and promoting the conversion & exhibition industry development. As the largest-scale international automobile show in northeast China, this exposition had a total exhibition area of 180,000 square meters and used all eight indoor exhibition halls and all outdoor exhibition areas in the Shenyang international conversion & exhibition center. This exposition had the most exhibition brands, and car manufacturers directly attended the exposition. This exposition attracted about hundreds of exhibition brands such as Rolls-Royceand Bentley, exhibited more than 1000 new cars, and more than 30 types of starter cars. 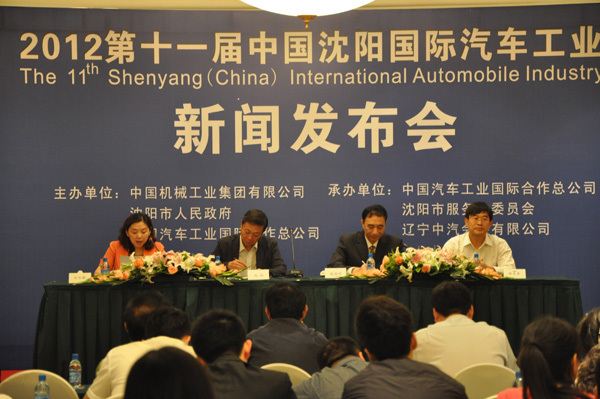 In addition, multiple car theme activities such as "2012 China (Shenyang) automobile industry development BBS", "photography competition", and "the awards dinner for the 11th 2012 China Shenyang international automobile industry exposition" were hosted at that time. Exposition organizers continued to set June 28 as the date for the media and professional audience, and national media paid high attention to the exposition. Nearly 200 media such as CCTV, Xinhua News Agency, China Daily, Shenyang Daily, Beijing Youth Daily, Sina, Sohu, Tencent, Netease, PhoenixNet, CAR AND DRIVER, AUTO SPORTS, and CHINA AUTO MARKET participated the in-depth reporting and interviews. The Shenyang international automobile industry exposition was co-hosted by China National Machinery Industry Corporation, Shenyang Municipal Government, and CNAICO, and co-undertaken by CNAICO, Shenyang service industry committee, and Liaoning CNAICO Exhibition co., LTD. Since founded in 1999, the exposition has gained strong support and attention from car manufacturers, dealers, the press, and the society. The exposition scale is expanding year by year, and exposition products gradually cover the whole auto area. At present, the Shenyang international automobile industry exposition has become the largest international auto show in Northeast China with the most exhibition brands, richest culture activities, and the most active trade transactions.